Last night we rounded up the kids (which only seems to get more and more challenging as they get older, even though they now don't need help with shoes, don't need to even wear jackets here and have no particular reason for taking forever!) we also brought Oscar, and headed away from the city lights out to Goodyear to watch the eclipse. We headed out to the Estrella Star Tower. The Star Tower is is 50 feet high and excellent for sky viewing. It's surrounded by a park and some waterfalls and is really quite nice. It also sparkles when the sun sets. This is a glowing sign on the side of the building. The place was full of people last night. They aren't in this photo though. In fact our photos are kind of lame. Night photos are just not so great with our camera. This is the view from the top of the tower. So our pictures of the eclipse are not so great. But, my good friend Kelly Clark Moncure in San Diego captured some amazing images. Of course she's a professional photographer and an awesome one! After standing for an hour on the stone tower we all felt pretty hot and hungry. (Yes, it's still pretty hot after night fall) We headed over to a pizza shop and watched it from there. Over all though it was pretty amazing though, and a great night out! Last week Phoebe made this incredible cheesecake for Mike's birthday. It was quite delicious. I managed to finish my second glow worm this week for The Grand Ave. Festival. Anyway this is his head. He's now waiting for the festival in our closet. I've also made great progress with the second bird I'm building. 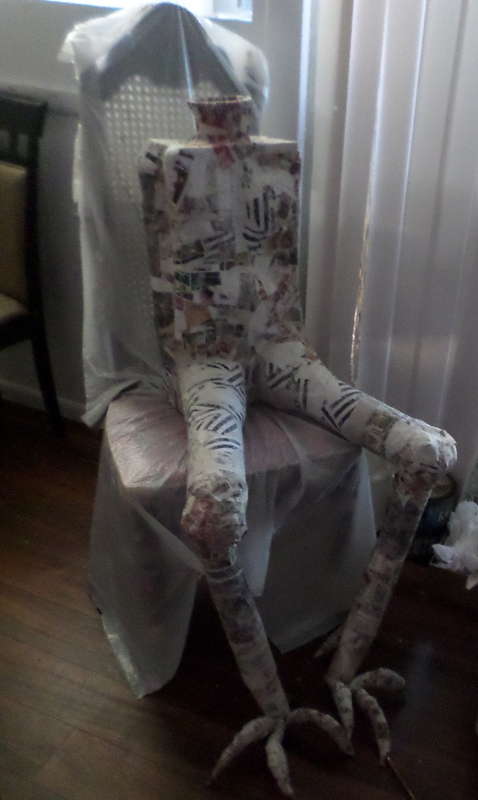 Here's his body in progress. Also, the exhibit Mike's art is in at the Blue Wave Gallery was reviewed in Art Scope Magazine. They called him a "SciFi Michelanglo"! And finally last week was the first day of class at the Montessori school pre-k. One little boy was helping me tape his art work into the frame. I said to him "You're very good at this, do you help your Mommy wrap presents at Christmas or Hannukah?" "It's a holiday like Christmas, where you wrap presents and give them to family." Then he got really quiet, but for the rest of the day he called me Miss Monica.